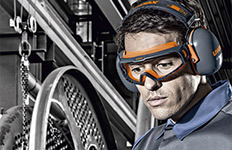 Uvex Skyper offers the simplicity of a uni-lens with stylish appeal. Wraparound design offers peripheral protection, molded-in nose bridge and browguard, adjustable temple length and inclination. Uvex Skyper has an easy and economical lens replacement system. Frames have a lifetime guarantee.